The plant parasitic nematodes from the genus Meloidogyne spp. (a.k.a. Root-knot nematodes, RKN) are one of the leading causes of losses in production of peanut (Arachis hypogaea) in the Southeastern U.S. One of the most sustainable measures that a farmer can implement is to use the resistant peanut cultivars. However, farmers tend to avoid the RKN-resistant peanut cultivar because they usually have low yield and/or kernel quality when compared to elite (RNK susceptible) cultivars. To avoid decreasing the peanut quality in production system, the alternative sustainable practice is the use of crop rotation. However, crop rotation is not a viable approach in central Florida, where peanut is planted every year. In this region, the last and least sustainable measure is used: annual application of nematicides. While the use of cover crops is prevailing in other parts of the country and information was widely available to crop growers, similar situations did not exist in the state of Florida. This project evaluated the nematode suppression capacity of six winter cover crops that are resistant to RKN and their subsequent impacts on peanut production. Two-season field experiments with six winter cover crops (plus control) followed by peanut growth were established in Plant Science and Research Education Center near Gainesville. The yield, height and percentage coverage of cover crop species were measured as well as the peanut yield. The RKN population was quantified before the establishment of cover crops and monitored until the harvest of peanut on the second year. The yield of grasses cover crops was significantly higher than other species regarding dry matter yield and this phenomenon was consistent across two years. Grasses showed lower nematode population than legumes during the cover crop season. However, when nematodes were present in the peanut season (only second season) this pattern changed and legumes showed lower nematode count than grasses treatments. While nematodes were present in most of the study period, appear that their number was not enough to create significant damage in the peanut plant and kernel health. Root-knot nematode (RKN) species are the predominant parasite of Florida peanut production, causing significant damage both to peanut yield and quality (Minton and Baujard 1990, McSorley et al. 1992, Dickson and De Waele 2005). The most sustainable farming practice alternative is to use the RKN-resistant peanut cultivars, such Tifguard or COAN. However, even though these cultivars have high resistance to RKN, their peanut yield is lower than top-yielding cultivars, such as the most popular peanut cultivar Georgia-06G. Crop rotation with cotton is another sustainable alternative used to decrease and avoid crop loss by nematode damage. However, due to the climatic conditions, this is not an alternative for central Florida. Thus the use of chemical control (nematicides) is the only option currently available to farmers of central Florida when susceptible peanut varieties are used. However, the application of nematicides increases production cost, breaks the ecological balance in the soil environment, and eliminates biological control agents, ultimately leading to reducing the sustainability of the agricultural system (Bridge 1996). Cover crops are generally used as agricultural cultural practices to improve the soil fertility, structure, and suppress weeds, nematodes, and other plant pathogens (Janzen et al. 1992). Additionally, winter cover crops species, including Triticum spp. (wheat), Trifolium repens L. (white clover), Trifolium pretense L. (red clover), Vicia sativa L. (common vetch), Vicia villosa (hairy vetch), Secale cereale L. (rye), and Tricoselace (triticale), may bring benefits beyond the nematode suppression. All of these cover crops can additionally be used as cash crops for grain or forage. The use of clovers can also benefit soil nutrition by fixation of nitrogen. The red clover cultivar ‘Southern Belle’ was selected for high resistance to M. arenaria race 1, M. incognita race 3, and M. javanica. The white clover cultivar ‘Ocoee’ was also selected for resistance to M. arenaria, M. incognita, and M. javanica. These two clover cultivars have shown low gall and egg mass number and interference with nematode developmental process and, therefore have been recommended for crop rotation (Call et al. 1996, Quesenberry et al. 2005). Both the rye, ‘Florida 401’, and triticale, ‘Trical 342’, have been shown to have low egg mass and to affect the reproduction of M. arenaria race 1, indicating they could be the potential superior candidates to suppress the nematode population (Ibrahim et al. 1993). The wheat cultivar ‘SS8641’ is an ideal cover crop due to its high resistance to leaf rust and stripe rust and it may possess the ability to suppress the nematode population in the field. By using RKN-resistant cover crops, it is expected that nematodes are able to identify and infest the cover crop plants, but not being able to develop or reproduce in them, thus reduction of the population of RKN could be achieved. For example, Quesenberry et al (2014) observed that the RKN-resistant red clover ‘Southern Belle’ reduced the fecundity of egg masses and thus suppressed the nematode development. If reproduction of nematode is suppressed, then its overall population ought to decrease. Additionally, RKNs are endoparasitic pests which means they become sedentary after they migrate to the target vascular bundle (Bird et al. 2009). Therefore, unlike mobile cyst nematodes, after harvest of the cover crops, the nematodes in their roots will be trapped in the immobile stage unable to migrate to infest the subsequent crop. By identifying the cover crops that can be used to decrease the population of RKN in the field, it is expected that the RKN susceptible peanut cultivars with high yield and quality can continue to be used by farmers, reducing the quantity of application of nematicides and their negative impact on the environment. While cover crops have been extensively studied in the northern part of the US, limited information is available in term of its usage in Florida. It has been promoted that more studies are needed to encourage farmers to adopt this sustainable alternative. The goal of this study is to identify the cover crop species/cultivar that can reduce the RKN-nematode population in a peanut production systems of central Florida and thus increase the yield of peanut. Specifically, evaluate the suppression of root-knot nematode (RKN) population from six winter cover crop cultivars resistant to RKN and measure the their effects on subsequent peanut yield in a peanut production rotation system. Two simultaneous field experiments were established at the University of Florida Plant Science Research and Education Center at Citra, FL. The first experiment was carried out on an RKN-infested field (artificially inoculated with peanut RKN), the second on a field without the presence of RKN. Each experiment was established in a randomized complete block design (RCBD) with four blocks and six winter cover crop treatments with two controls as described in Table 1. The combination of common vetch, known to be RKN susceptible, and the susceptible peanut variety, Georgi06G, was the positive control, and common vetch followed by RKN resistant TifGuard was the negative control. Plot size for the cover crops was 3 meters wide by 8 meters long. This plot size allowed at least four rows of peanut planted under standard planting conditions. Table 1. Treatment from combination of cover crop and peanut and their respective code ID. The cover crops were established in Nov 2014 and 2015 using a grain drill under recommended seed rate. Standard management practices were used for all cover crop species. Cover crops were harvested in late April in both years and data for dry matter yield (kg), coverage percentage (%) and plant height (cm) was collected. Peanut was established in early May both years in four rows per plot using a row cone planter with the recommended planting rate over each plot of the two experiments detailed above. Appropriate nutrients were provided and necessary measures were taken to control weeds and insects. Peanut was harvested in late September in both years and its yield (kg) was measured by the standard methodology. Soil was collected and sent to the UF nematode lab to receive the bioassay results regarding the nematode type and number. Nematode identification and counting started before the establishment of cover crops and soil samples were taken every two months until the harvest of the peanut at the second year. These experiments were established in two consecutive years at the same locations (and plots) to study the cumulative suppression effect of resistant winter cover crop varieties. Analysis of variance combining all years and RKN infestation condition were performed in the software R (R Development Core Team, 2013) for the variables: cover crop yield, peanut yield and nematode number. Analysis considering only one year or one RKN condition were done depending on the significant interaction effects of these factors with the cover crop species. A multiple comparison Tukey HSD was performed when factors were significant. The cover crop dry matter yield analysis of variance (Table 2) indicated that the RKN-infested condition, year, and cover crop species were significant different (P-value<0.01). 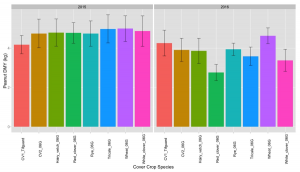 However, the interaction year by cover crop species and that the three-way interaction RKN condition-by-year-by-cover crop species was significantly different (P-value < 0.01). Thus, when considering the RKN-infested condition in year 2015 (Figure 1), rye had significantly (P-value < 0.01) higher dry matter yield than all other cover crop species but wheat. Wheat yielded significantly higher than the two vetch and the two clovers (P-value < 0.001). Triticale, common and hairy vetch yielded significantly (P-value < 0.01) more than white clover. The RKN infested trial in 2016 showed no statistical significant differences among dry matter yield of the cover crop species. In the RKN non-infested experiment at year 2015, wheat and rye yielded significantly (P-value<0.001) more than all other cover crops but there was no difference between them, while triticale yielded significantly (P-value < 0.05) more than white clover. The trial in the RKN non-infested field in 2016 had triticale producing significant (P-value < 0.001) higher yield than all cover crops but rye and wheat. On the other hand, rye produced significantly more than both clovers and wheat more than white clover (P-value < 0.05). 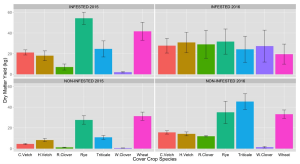 The performance of grasses species were more consistent across the two years and RKN infestation conditions, while white clover in this area yielded significantly less consistently than all other cover crop species. These clover species, especially white clover are adapted to growth in combination with grasses, which could be one of the reason of their low yield. Table 2. Analysis of variances for cover crop plot dry matter yield in two years and two RKN-infested conditions. Figure 1. Cover crop dry matter yield (kg per plot) for 2015 RKN infested condition (upper left), RKN non-infested condition (lower left), and 2016 RKN infested (upper right) and non-infested experimental conditions (lower right). Table 3. Analysis of variances for peanut dry matter yield in two years and two RKN-infested conditions. Figure 2. Peanut dry matter yield (kg per plot) of the two peanut cultivars under the RKN infested (right) and non-infested conditions. The behavior of the peanut yield on the two peanut cultivar was as expected (Figure 2). Georgia06G yielded significantly higher dry matter than TifGuard in the infested trial with better soil conditions. However, at the second year, and under the presence of higher nematode population in the peanut production season, the ranking is reversed, TifGuard yielded significantly higher than Georgia06G. Also, as expected no difference was found in peanut production in the non-infested experiment across both years. When the treatments from the combination of cover crops and peanut cultivars were included in the analyses, the peanut dry matter yield was significantly (P-value<0.001) affected by the RKN infestation condition and its interaction with year (Figure 2). Contrary to the expectation, the non-infested trial yielded less than the infested trial. This happened because the non-infested trial was established on a less productive area (top of a hill), due to the lack of adequate land, while the infested trial soil conditions was generally better (bottom of the hill), leading to better and longer maintenance of soil humidity. This is a very relevant component in the sandy soils of Florida. Year effect was significantly different as well in the infested trial, with year 2015 yielding significantly more than 2016 (Figure 2). This difference of yield could be explained by the increase in the nematode population in the peanut season in 2016 (Figure 3). Figure 3. RKN counting in the different cover crop treatments across the two cover crop and peanut seasons (2015-2016). No cover crop treatment was found to significantly affect the peanut production during the first peanut harvest season (2015, Figure 4). But no nematode pressure was observed during this peanut production season (Figure 3). However, peanut yield on the red clover plot yielded significantly less in 2016 than the negative control (common vetch-TifGuard) and the treatment of wheat followed by Georgia06G. This could not be explained by the nematode counting, as the red clover plots had the lowest count than all other cover crop treatments by the end of the second peanut season (Figure 3). Significant difference in the nematode counting was observed for the cover crop season, consistent in both years (Figure 3). All grass cover crop treatments had significantly lower nematode counts than other treatments, followed by the clover treatments. As expected the vetch treatments had the highest nematode count in this period. After the peanut was established, the two years had significant different patterns. The nematode population decreased significantly in both years by August, but the second year had higher nematode populations than the first year. As nematodes did not decrease to extremely low values in the second year, a higher counting was observed also by the time of peanut harvest. Only by the harvest of the second year peanut season, we observed the positive and negative control behaving as expected (significantly different) and here we can differentiate the real effect of the cover crops on the nematode populations. In this measurement we observed an opposite pattern, compared with the cover crop season, legumes (clovers and hairy vetch) decreased the nematode population significantly more than the grasses. However, we believed that the nematode counting in all treatments was not enough to make a difference in the peanut production as peanut plants appeared to be healthy and no major damage in the peanut kernels was observed. Figure 4. Peanut dry matter yield (kg per plot) for 2015 (left), and 2016 (right) under both RKN conditions. Based on the overall cover crop dry matter yield across the growing-season, the recommended cover crops to incorporate into the peanut production system are rye, wheat, and triticale. In term of peanut cultivars yield, in 2015, the ‘Georgia-06G’ performed better in the better site, whereas in 2016 in the same site but under nematode pressure, ‘Tifguard’ was superior. Also, when nematodes were present, the peanut cultivar ‘TifGuard’ decreased the nematode population significantly compared to ‘Georgia06G’ when both followed the susceptible cover crop common vetch. While, red and white clover also showed great capacity to decrease the nematode population across both seasons they had a negative impact on the peanut yield that could be related to the low dry matter production they had in both years. Considering the effect of cover crops on peanut yield, we cannot make recommendations based on two years as we observed nematode effects on peanut production only in the last season and appeared that the nematode counting was still not enough to create significant damage in the peanut. Study will be publish in the near future. The information generated in this study will be provided to the University of Florida peanut breeder, and extension faculty to be used in recommendation to peanut producers. Additionally, this report will be made available to faculty studying cover crops, and nematodes so they can further study other aspects not included in this work. 1) Cover crops can significantly reduce nematode populations in the different seasons. 2) Cover crops with resistance to RKN that suppress RKN populations may reduce the selection pressure from the resistant cash crop, extending the resistance break-down period of the cash crop resistant cultivars. 3) Peanut has an inherent advantage in sustainable production: it is a legume crop, which means it forms a symbiotic relationship with nitrogen-fixing bacteria within nodules in its root system. When the plants are harvested or incorporated, the fixed nitrogen will be released slowly. The slow releasing of organic nitrogen source is less susceptible to leaching and can serve as fertilizer for the cover crops, which in turn will be re-incorporated into the soil for use by the subsequent peanut crop. The nitrogen re-cycling from the cover crops will make the entire system more sustainable by reducing fertilizer requirements and leaching risks. Additionally, red and white clovers can also fix nitrogen by themselves. Thus, after incorporating them in the soil, the additional nitrogen can be used for the subsequent peanut crops as an organic nitrogen source. No farmer recommendation could be produced before further studies are carried out to explore the long-term impact of each cover crop species. Therefore, no farmer adoption has been carried. We found that different cover crops species appeared to significantly reduce the nematode populations in an artificially infested peanut field. However, further benefits may exist if these cover crops are mixed (e.g. grasses plus legumes). A long-term study will be needed to make final conclusions about recommendation of the cover crop species for peanut production system.